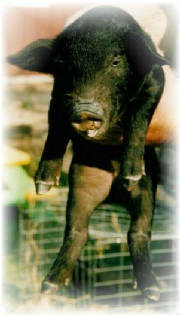 Mulefoots are classified as "Critical" by the American Livestock Breeds Conservacy & are the rarest American pig breed. This means that there are less than 200 annual registrations of these hogs, and less than 2000 in the global population. The most distinctive feature of the American Mulefoot hog is the solid hoof, which resembles that of a mule or horse. Pigs with solid hooves (also called syndactylism) have attracted the interest of many writers over the centuries, including Aristotle and Darwin. The American Mulefoot is the only syndactyl breed with a documented history & breed standard. Mulefoots are solid black with occasional white points (feet or nose), medium flop ears & a soft body coat. They are typically docile, friendly & exceptionally intelligent animals. In the early 1900’s, mulefoots were considered premium "ham-hogs", and were fed to great weights before slaughter. A typical mulefoot today will reach 400-600 pounds by age 2. The American Mulefoot Hog Association and National Registry. The associations goal is to document and preserve the American Mulefoot Hog. The Association is currently registering all breeding stock, free of charge, for a limited time. Registration forms/transfer forms, breed standard, as well as membership applications are available online. Visit the Yahoo! group : mulefoot - a place breeders and interested parties talk pigs! Reservations are encouraged to guarantee availability. Visit our reservation form page, print and mail to us. Reservations are filled in the order in which they are received. We always love to talk pigs!